Former world heavyweight champion Lennox Lewis led the condemnation of the judges who denied Tyson Fury a fairytale win over Deontay Wilder in Los Angeles. Despite climbing off the canvas twice - the second knockdown in the final round appeared to momentarily leave him out cold - most observers thought Fury had done enough to claim a decision. Victory would have completed a remarkable comeback for Fury, who has shed in excess of 100lbs and dealt with serious mental health issues over the last couple of years. 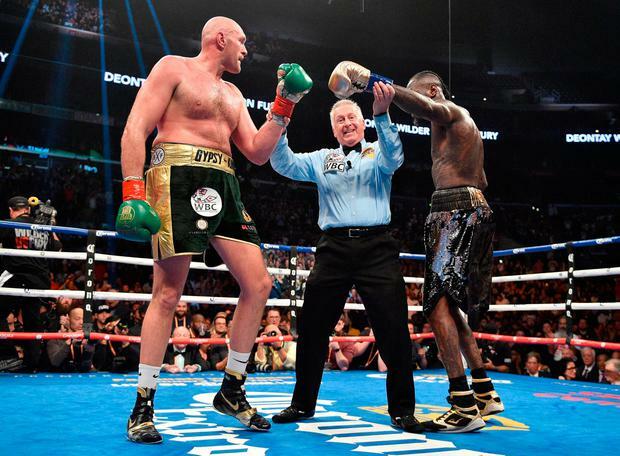 But the contest was scored 115-111 for Wilder, 114-112 for Fury and 113-113 as a draw was declared, meaning Wilder retained his WBC heavyweight title. Speaking as a pundit for BT Sport Box Office, Lewis said: "They need to get some good judges, these judges were terrible. "It happened to me and I knew it was going to happen to him. Everybody could see who won. Boxing definitely won and Tyson Fury won the fight to me. "But that's why you've got to go in and try and knock the other person out, especially if you're not on home soil. You've got to make your fists be the judges." Lewis added: "I think Deontay boxed terribly. He has a great right hand but he wasn't able to put it to bed until the last couple of rounds. "He's always got that power. I think when he's tired he's more dangerous because he just flings those punches around and if one of them hit you round the head, you're going to go down and it happened. "To me Tyson Fury put himself in harm's way and caused himself to get knocked down." The result caused consternation among those watching on. Former two-weight world champion Andre Ward wrote on Twitter: "A draw, I understand (even tho I feel Fury won by a 2 or 3 rds). "With 2 knockdowns & round here or there for Wilder and you have a draw in some people's eyes. But 115-111 for Wilder is terrible, just terrible !! That's what's wrong with boxing. Fury's stock went up !!!!!" Trainer Dave Coldwell tweeted: "I gave Wilder two 10-8s and one other round. That's it. Fury was brilliant tonight and the only man that looked like a winner." He wrote on Twitter: "As a sportsman what @Tyson_Fury has done tonight must be respected. What he has been through in his personal life, to put in a performance like that." Manny Pacquiao, who has won world titles in eight weight classes, added on the social networking site: "Respect to Fury for sticking to his game plan and to Wilder for closing the gap with two huge knockdowns! Can't wait to see the rematch." Los Angeles Lakers basketball star LeBron James wrote: "Man that was the funniest/craziest fight I've ever seen in my life."